Variatio 3 a 1 Clav. Canone all’ Unisuono. Variatio 5 a 1 ovvero 2 Clav. Variatio 6 a 1 Clav. Canone all Seconda. Variatio 7 a 1 ovvero 2 Clav. Al tempo di Giga. Variatio 9 a 1 Clav. Canone alla Terza. Variatio 10 a 1 Clav. Fughetta. Variatio 15 a 1 Clav. Canone alla Quinta in moto contrario. Variatio 16. Overture a 1 Clav. Variatio 18 a 1 Clav. Canone alla Sesta. Variatio 22. Alla breve a 1 Clav. Variatio 27. Canone alla Nona. Variatio 29 a 1 ovvero 2 Clav. Variatio 30 a 1 Clav. Quodlibet. On this CD an accordion takes the listener along on a long, existential journey out of silence. Bach composed this "Aria with Diverse Variations" for Count Hermann Carl von Keyserlingk to be a little cheered up in his sleepless nights by harpsichordist Johann Gottlieb Goldberg, a pupil of Bach and in the service of the Count at that time. Whether this anecdote is true or not, today, more than 250 years after the Goldberg Variations were composed, they offer a listening experience with a shifting balance between inexhaustible external kinetic energy and complete inner piece. It is also time to lay aside the prejudices concerning accordion and its reputation as mainly a folk music instrument. 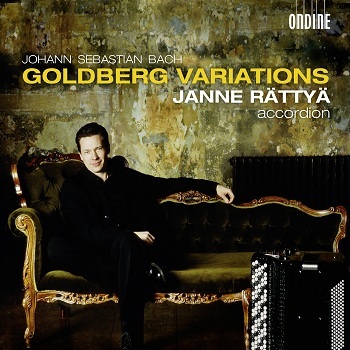 The fresh performance and splendid musicality of Janne Rättyä show how expressive and delicate the accordion can be, and even serve the purpose of doing justice to as an iconic keyboard work as the Goldberg Variations. The Finnish accordionist Janne Rättyä is regarded as one of the most successful classical accordionists. He performs as a soloist and chamber musician throughout Europe, in the U.S. and Asia and has appeared with musicians such as Jorma Hynninen, Pekka Kuusisto, Martyn Brabbins and Patrick Gallois, but also as a soloist with many Finnish and foreign orchestras. Janne Rättyä was awarded numerous prizes in various international classical accordion and soloist competitions, most notably the first prize in the Arrasate Hiria competition in Spain in 1996. He collaborates closely with contemporary composers like Aldo Clementi, Dieter Schnebel, Uljas Pulkkis and Iris ter Schiphorst, to create new music for his instrument.